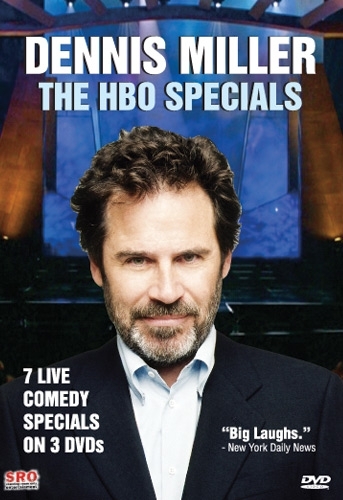 For the first time, all seven of Dennis Miller's hilarious HBO Comedy Specials are available on DVD in this complete Special Collector’s Edition 3-DVD Set. This is a 3 DVD set! "For those of us who have pined many moons, equal parts impatient and incredulous, for his inexplicably unreleased HBO comedy specials from the ‘90s; it’s time to celebrate an overdue victory. Dennis Miller: The HBO Specials is exactly what the doctor ordered for fans who remember the days when a thesaurus was a requisite part of the experience. A comic who could make you laugh and think is never something to take for granted, as they are always in woefully short supply. 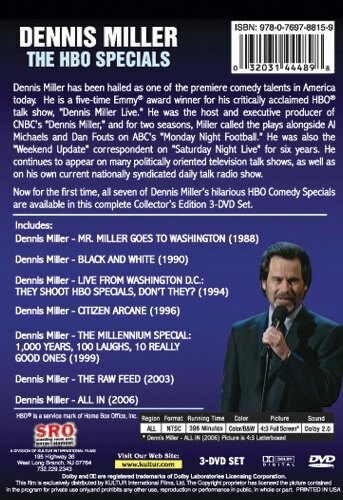 Dennis Miller still looms large as one of the five best stand-up comedians of the past 20 years. This egregiously overdue purging of the HBO vaults should come as a welcome relief to fans who remember watching these specials in real time. "